Hosting a dinner party or a BBQ? Here's how to plan a menu that will leave everyone happy and full. To paraphrase food critic Michael Pollan, we should all be eating real food, not too much, mostly plants. And never anything your great-grandmother wouldn’t recognize as food. What does that have to do with party planning? It’s a succinct reminder that if you stick to whole ingredients, in season and grown following organic practices when possible, and offer up a clearly labeled spread (especially for the big eight food allergens), you’ll have a bunch of happy guests from the entire rainbow of eating habits hoping for a return invitation – and soon. Your “normal” friends may not even notice the difference, but your food-safety-conscious ones will be making heart-eye emojis at you for days. It’s always easier to plan ahead when you know what you’re dealing with, and the easiest way is to ask. Send a quick note to your guest list asking about allergies and their severity. For instance, if there’s a deadly allergy in the group – say, peanuts or oysters – you can ask those friends for their help in making sure the menu and your kitchen are safe and stress-free. If there’s a consensus – say, most people are avoiding dairy these days – then you can easily narrow down your menu to cheese- and milk-free recipes, try a vegan alternative, or simply put the cheese or butter on the side. Ask anyone who suffers from food allergies or sensitivities, and they’ll tell you that all they really wish for, more than anything in the world, is clearly labeled restaurant menus listed out with each and every single ingredient used in the dish, down to the spices. Nobody wants to “be that person” and bother the server, kitchen, or host just to be able to make their eating decisions without getting sick. A pretty, printed menu is such a rare delight these days, especially at informal and intimate gatherings, and takes only a few extra minutes to pull together. Just imagine how impressed every single one of your guests will be with this surprising, thoughtful, and dressed-up gesture. For between $5 and $10, Etsy has a number of gorgeous download-and-print menu templates available to design at home – and in a flash. One of my favorite ways to delight a crowd and make sure everyone leaves full and happy is to serve up brunch or dinner in a buffet-style format, with a bar of a la carte ingredients and toppings clearly labeled and positioned to prevent cross-contamination. Taco bars, baked potato bars, brunches, and other more congenial culinary staples naturally lean into being an allergy sufferer’s best friend. 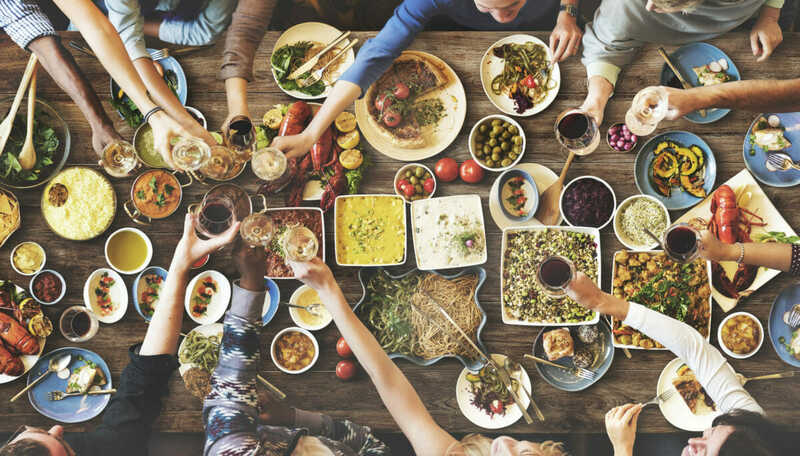 If you have a diverse culinary crowd, everyone will be happy so long as there are both meat and vegetable proteins (like lentils or chickpeas) and both glutinous and gluten-free starches – the latter is especially important if you’re serving alcohol. Everyone deserves something to soak up the booze! Instead of playing around with gluten-free baking or vegan substitutions if those aren’t dietary roadblocks that you already plan around, stick to recipes that are naturally gluten-free or naturally dairy-free. If you have an old standby that you’ve made a million times, ask yourself: How easy is this to adapt? If the answer is simply swapping butter for Earth Balance or olive oil, or opting for pre-made gluten-free bread or croutons, then go for it. But don’t take big risks if you’re impressing guests – coconut aminos do not taste “just like” soy sauce, and cassava flour or coconut flour can take several failed attempts before serviceably passing for wheat flour in baked goods because they both soak up more moisture. Bookmark these crowd-pleasing, naturally gluten-free vegan recipes: Thai coconut green curry vegetables over jasmine rice, a classic ratatouille, watermelon or sweet corn gazpachos, and bean and quinoa chili. If you really feel like protein is lacking, put a dish of grilled chicken, beef, shrimp, sausage, etc. on the side.